LeRodrick Terry, Ph.D., has accepted the position of vice president of student affairs at Rio Salado College effective July 1, 2015. He was selected following a national search. Terry brings a proven track record of results-driven leadership, teamwork and student success to the college. Terry has worked in higher education leadership roles for more than 10 years. 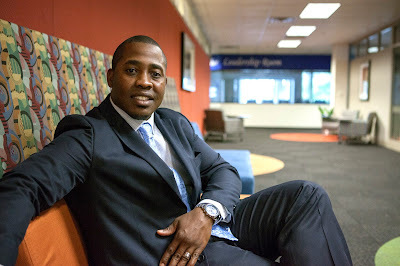 He previously served as dean of student services at Hillsborough Community College in Tampa, and in director roles at Talladega College in Alabama, and Shorter University in Georgia. “Dr. Terry is a passionate advocate for student success and has a strong reputation as a student-focused, collaborative leader who explores and implements innovative strategies to support student services, recruitment and retention,” said Dr. Chris Bustamante, Rio Salado College president. “His wealth of knowledge and experience will benefit Rio Salado College and the Maricopa Community College District through the many contributions he will make during his tenure here." Terry’s work has focused on developing innovative recruitment and retention strategies, increasing completion rates, promoting student advocacy, and creating best practices that positively support student affairs and diversity. As vice president of student affairs, Terry will oversee the administration and strategic planning of the college’s academic advisement, ace puente/hoop of learning, admissions, records and registration, college copy center services, disability resources and services, financial aid, international education, institutional advancement, judicial affairs, quality assurance and training, student life and leadership, testing and assessment, and veteran services departments. In addition, he will have oversight of the strategic enrollment management initiative, commencement and the development of a welcome center for the college. Terry’s academic background also includes teaching. He served as an adjunct faculty instructor for seven online universities. He has also taught in-person middle school, high school and GED classes in Alabama and Florida. Terry holds a Ph.D. and M.Ed. in Higher Education Administration from Auburn University, and a M.A. in Leadership from Shorter University.